What are confidence and connection levels? For each region in your DNA story based on our reference panel, we look at the range to evaluate the evidence that the region is part of your genetic ethnicity. Regions that are less likely to be part of your past end up in two categories: low confidence regions and other regions tested. In low confidence regions, the estimated range always goes down to zero, meaning you may not have any ancestry from this region at all. Regions that include zero may not be considered low confidence if the range goes above 15% or if the estimated ethnicity is 5% or more. Consider the example below where a customer has an estimated 5% genetic ethnicity from the Ireland, Scotland & Wales region. 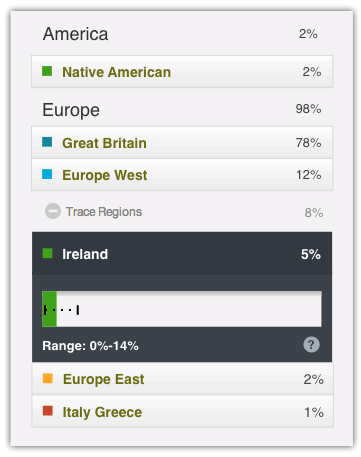 EXAMPLE: A customer has an estimated 5% genetic ethnicity from the Ireland, Scotland & Wales Region. This region is displayed as a low confidence region because the range includes zero and is not greater than 15. Regions where the range does not go below 1% are not put into this category. 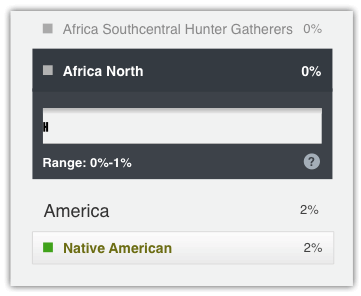 In the example above, the customer’s results predict 2% Native American genetic ethnicity, with the range going from 1% to 3%. While the percentage is low, the range does not include zero, so it does not fall under the low confidence regions. When there is very little evidence that a particular region is part of someone's genetic ethnicity, it is included among other regions tested. You can see these regions by selecting "Show all regions." These are regions where the percentage of estimated ethnicity is less than 0.5%, and where the range does not exceed 2.5%. Although there might be some signal from these regions in our genetic ethnicity prediction, we believe that there is not enough evidence to support you having this genetic ethnicity. EXAMPLE: A customer has a range from 0-1% and an estimate of 0%. We determine whether a region based on a Genetic Community is part of your past by using machine learning to build a set of rules to determine how likely it is that you belong to a particular Genetic Community. Those rules are based on your DNA matches and the Genetic Communities they belong to. A lower confidence score means that you're less likely to belong, while a higher confidence score means you're well connected to that Genetic Community and the region associated with it.